Belgium - for sale on Ebay! The country of Belgium was listed for sale on Ebay this week! Free delivery was offered, but the buyer would have to take on £150m of national debt and bankroll the Belgian royal family. The spoof Ebay listing was a protest against the country's politicians. Since the June 10th election Belgium has had no government as the Dutch-speaking Flemist politicians have been locked in a power struggle with the French-speaking Walloon politicians. 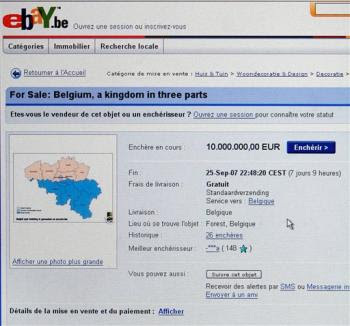 The listing was entitled "For Sale: Belgium, a Kingdom in three parts ... free premium: the king and his court (costs not included)" and was live for 3 days until Ebay cancelled it after a bid of €10million was received. A novel way of protesting and great awareness raiser - had anyone seen any coverage of this political situation until the 'Belgium for sale on Ebay' story was published? !